One of the cool features of Citrix's Advanced Access Control is the end-point client scanning feature, called "end-point analytics" (EPA). This is the feature that performs a security scan of a client device before establishes a VPN tunnel to determine how secure the device is. One of the cool features of Citrix's Advanced Access Control is the end-point client scanning feature, called "end-point analytics" (EPA). This is the feature that performs a security scan of a client device before establishes a VPN tunnel to determine how secure the device is. While these EPA scans held a lot of promise, many people were disappointed that Citrix's "out-of-the-box" scans didn't have enough functionality. Fortunately Citrix released an EPA SDK which allowed people to write their own scans. A few of these people got together and formed a company for this purpose called EPAFactory. Over the past few years they've really established themselves as Advanced Access Control experts, and they've presented on this topic at BriForum in the past. EPAFactory didn't really have any competition in the end-point analytics space until a few months ago when a company called Ententrix sort of appeared out of nowhere. Whoops! 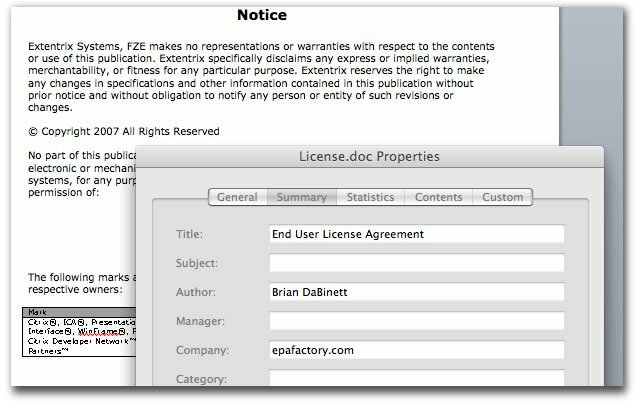 The Ententrix documentation lists a company name of "epafactory.com." Worse yet, it lists the author as "Brian DaBinett," a friend of mine and one of the founders of EPAFactory. I talked to Brian recently and he most certainly is not working for Extentrix. So if Extentrix is cutting-and-pasting the documentation from EPAFactory, what else are they copying from them? Looks like they cut and paste from Microsoft.com and Citrix.com too. A quick look around their web site looks very familiar. Thanks for exposing this unethical company. The owner (should be named) and the company employees obviously do not have integrity. I will never recommend Extentrix regradless of what they come out with. Perhaps they should be spelled Extentricks. I am very thankful for them for offering great scan packages at affordable price. The fact is that they have fascinating products. They may be cheaper because the Extentrix people in Dubai may have copied the EPAfactory code. I doubt that. If they copied the code they would have the same packages as EPAFactory. They are smart in their offerings and marketing. I give them thumbs up. Keep good work. Hmmm, I think this person works for them. Well this has generated some comment and I don't like posting as a Guest so thought I would take a moment to reply. They say imitation is the greatest form of flattery but we were certainly surprised to see the similarity in the products and documentation released by Extentrix; especially as they signed an NDA with us last year and one of their products was an exact replica of some the scans we had created! Competition can only improve the quality and breadth of products that are released to market, so it can only benefit the community longer term and we have been waiting a long time for someone to come along with their own products. Indeed, we are making some exciting new product announcements at Citrix Summit. I don’t want to tell too many details in case anyone tries to steal our thunder (or ideas ;)), but there will be a new entry level AV product and some really cool features in the full blown EPdetect version, both of which will detect over 300+ AV products. Plus some other stuff already announced on the website (www.epafactory.com). Extentrix should help drive the market forward but next time hopefully they can generate their own ideas and documentation. Extentrix copied the EPAFactory None Disclosure document. Extentrix are the first to come up with Essential name and package many EPA scans in one. EPAFactory followed them. Extentrix are the first to package AVs and FWs scans in one package. EPAFactory followed them. It is the competition. We are the customer who are benefiting from this. Also they are the first to offer Essentials @ US$999. EPAFactory copied them. They are the first to offer unlimited users license model for their scans @ one price. EPAFactory copied them. If a person wants to compare, let him/her compare what functionalities there are in the Packages. Creativity lies there, not in a documentation you can find over the whole internet, not just in epafactory. I am sure it's a market play that aims to distort the good reputation of Extentrix. You know both are competing. Lets say The document was taken as template from EPAFactory and yes its a amistake that Extentrix forget to edit the properties .What about the contents? I have great curiosity to try Extentrix EPAs. Being a book author I may have a slightly different view compared to some other people when it comes to copying a document. Yes, it can happen that you accidently use text for your own documents that was originally created by someone else. But you should be very careful about such things in a commercial product. Just to make things clear; seen from a legal perspective the documentation belongs to a software product as does the source code. So copying documentation is like "borrowing" someone else's car without asking him, just because the car happens to be standing in front of your house. Intellectual Property is a serious thing, even if it is only a license file. The last time I needed a lawyer specialized in international software licensing he charged me 300 EURO (= US$500) per hour. Taking the licensing document from a competitor is definitely cheaper. Guess what Citrix would do if you wanted to build a business on creating a tool including some features Citrix also provides (= legal, as long as you didn't steal their code) and then distribute your tool with an exact copy of the Citrix documentation (= illegal). The Citrix legal department would definitly sue you, and nobody would blame them for doing so. Accario went out of business last year. This is has been confirmed to me personally. It is sad that this happens to them. Fortunately, we are taking our responsibility and respond it to their customer demands. 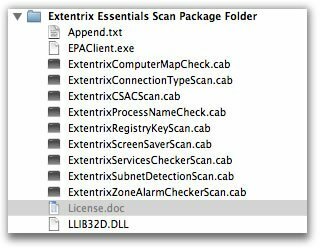 Extentrix is offering its EPA Scans for Citrix Access Gateway Enterprise and Advanced (http://www.extentrix.com/epa).